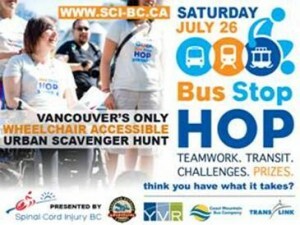 Join us for the Bus Stop Hop – Vancouver’s Only Wheelchair Accessible Urban Scavenger Hunt! 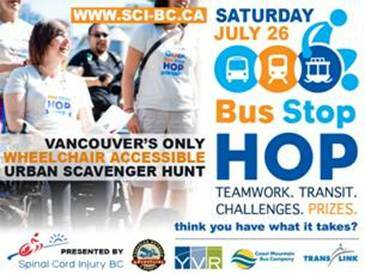 On Saturday, July 26, 2014, Spinal Cord Injury BC, in partnership with BC Translink, is throwing Vancouver’s only wheelchair accessible urban scavenger hunt – BUS STOP HOP. Inspired by the Amazing Race, the one-day event promotes familiarity and accessibility of public transportation. Four person teams, two-able bodied people and two people using wheelchairs or mobility devices, will race around the city using accessible transportation to complete activities and objectives while winning some great prizes. The race starts and ends, with a BBQ, at Olympic Village on the south side of False Creek. Best of all, it is FREE to participate! 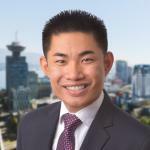 Spinal Cord Injury BC provides information and support to those living with spinal cord injuries or related disabilities in British Columbia. Their programs help the injured and their families adjust, adapt and thrive in their communities. For more details please visit Bus Stop Hop.